With a DR 14.5 Pro Stump Grinder you will never again have to struggle with back-breaking and time consuming methods of stump removal like digging by hand, ripping out with a tractor and chains, burning or chemicals. Tackle any stump size and just watch it disappear! Thanks to a reliable and powerful Briggs & Stratton engine producing 7.0kW of power and carbide-tipped cutting teeth, the DR Stump Grinder can pulverise any size stump and turn it into a pile of wood chips. Compact and manoeuvrable, the DR Stump Grinder can operate almost anywhere. The DR stump grinder is not a complicated machine. In fact, DR purposely designed it to be remarkably simple and easy to use. Just pivot the machine from side to side and shave that stump away! 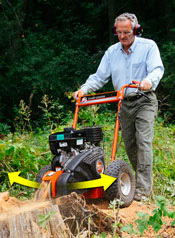 Simply position the DR Stump Grinder over the stump, lock the left wheel in place with your hand brake, engage the cutting head and pivot easily from side to side. That is all there is to it! You'll shave an inch or so off with each pass. The secret to the DR stump grinder is its patented cutting head with tungsten carbide-tipped cutting teeth, which are 10 times harder than steel. In fact, carbide blades are so tough that they are used in the mining industry to drill through rock. The cutter head is mounted vertically on the machine, allowing the cutter to work like a router - discharging chips quickly and out of the way. The eight cutting teeth are locked into the cutter head and supported by double-sealed roller bearings. Spinning at 2800rpm, these teeth take 360 bites per second! Unlike commonly available grinders that are heavy and cumbersome, the DR Stump Grinder is light, without sacrificing strength and durability. The adjustable handlebars keep the operator comfortably in control. 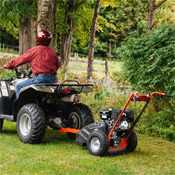 A simple, rugged design constructed of 12-gauge steel, with few moving parts, means this machine will be around for many years of fast stump removal. With its mining-grade cutting head, the DR Stump Grinder is a cut above any other machine for stump removal. Can I remove any size tree stump? The Dr Stump Grinder can handle stumps of any hardness or any size footprint, but it is not designed for stumps that are more than 5" in height. Taller stumps would be cut as close to the ground as practical before grinding (the higher the strump, the longer it will take to grind). How long does it take to grind a stump? It depends entirely on the diameter and height of the stump and the density of the wood. Softwoods can be ground down faster than hardwoods. Small stumps of less that 6" in diameter can be removed in just 5-10 minutes. Larger stumps, 6-12" in diameter, may take up to 45 minutes. What if I hit a rock while grinding? 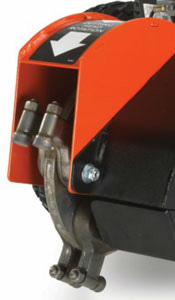 The cutting teeth on the stump grinder are carbide-tipped and can cut into the hardest substance you will enounter. So, very likely, you will grind away stone surfaces before you even notice they are stone. 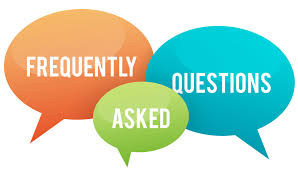 Naturally, DR recommends that you avoid stone as it will dull the cutting teeth more quickly than wood, but it is difficult to cause permanent damage to teeth with incidental contact. How long will the teeth last? Again, it depends on the type of wood you are grinding. In general, DR found that a set of teeth will last for about 60 hours. After that, a spare set can be easily installed (see related items below). Handle Type: Height adjustable (with tools): 33", 37", 40"
Dimensions: L: 51" x W: 29" x H: 39"
The cutter head features eight steel teeth that are tipped with mining-grade tungsten carbide a material 10 times harder than steel and which is used for drilling through bedrock. Spinning at 2800 rpm, these teeth take a remarkable 360 "bites" per second! The eight teeth are mounted in pairs, and each tooth locks into one of three grinding positions. When the grinding surface gets dulled in one posiiton, you simply rotate the tooth to the next position (takes just 30 seconds pwer tooth), and you've got a new sharp edge to work with. When all three edges are worn, replacing the whole tooth is quick and easy. With lugged, high-flotation tyres with a knobbly tread and a lightweight design, the DR Stump Grinder is easy to transport to any stump on your property. And because of their size, the tyres keep the machine elevated over the growing wood chip pile as you grind a stump away. 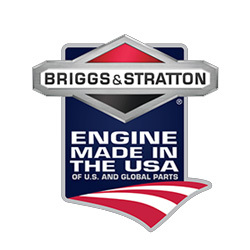 The legendary power, performance and durability of Briggs & Stratton® engines make them the only ones DR uses on their stump grinders. This model uses a durable 306cc Overhead Valve, easy-starting engine. It features a debris management system that protects the engine from whatever you kick up while you’re grinding stumps. For stumps that are farther away, DR offers the convenience of an optional tow kit which allows you to hitch up to your lawn tractor or ATV. The kit includes mounting bracket, tow bar, pin hitch, ball hitch, all necessary hardware, and installation instructions, and can be attached or removed without tools.